This Sunday's readings focus on gratitude to God. Our first reading from the Second Book of Kings (5:14-17) sets up our Gospel reading very nicely, It is the story of Naaman, a pagan army general who was healed of his leprosy by the Prophet Elisha. In a pagan world where there were many local gods, Naaman, in his gratitude, recognized the Lord as the one true God of all the earth. "Naaman went down and plunged into the Jordan seven times at the word of Elisha, the man of God. His flesh became again like the flesh of a little child, and he was clean of his leprosy. Naaman returned with his whole retinue to the man of God. On his arrival he stood before Elisha and said, 'Now I know that there is no God in all the earth, except in Israel. Please accept a gift from your servant.' Elisha replied, 'As the LORD lives whom I serve, I will not take it;' and despite Naaman's urging, he still refused. Naaman said: 'If you will not accept, please let me, your servant, have two mule-loads of earth, for I will no longer offer holocaust or sacrifice to any other god except to the LORD.'" In our Gospel reading (Luke 17:11-19), we hear another story of lepers being healed. Only one of the ten, a non-Jew, came back to Jesus in gratitude and glorified God. "As Jesus continued his journey to Jerusalem, he traveled through Samaria and Galilee. 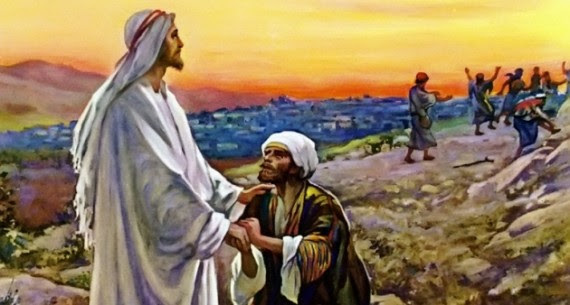 As he was entering a village, ten lepers met him. They stood at a distance from him and raised their voices, saying, 'Jesus, Master! Have pity on us!' And when he saw them, he said, 'Go show yourselves to the priests.' As they were going they were cleansed. And one of them, realizing he had been healed, returned, glorifying God in a loud voice; and he fell at the feet of Jesus and thanked him. He was a Samaritan. Jesus said in reply, 'Ten were cleansed, were they not? Where are the other nine? Has none but this foreigner returned to give thanks to God?' Then he said to him, 'Stand up and go; your faith has saved you.'" In our Epistle reading (2 Timothy 2:8:13), St. Paul reminds his readers of the Gospel he preached and his suffering in prison, gladly on their behalf. He offered encouragement to remain faithful, but also a word of caution of the consequences of denying Christ. "Beloved: Remember Jesus Christ, raised from the dead, a descendant of David: such is my gospel, for which I am suffering, even to the point of chains, like a criminal. But the word of God is not chained. Therefore, I bear with everything for the sake of those who are chosen, so that they too may obtain the salvation that is in Christ Jesus, together with eternal glory. This saying is trustworthy: If we have died with him we shall also live with him; if we persevere we shall also reign with him. But if we deny him he will deny us. If we are unfaithful he remains faithful, for he cannot deny himself." Today, we see examples of gratitude to God for blessings, but also the example of those who didn't bother to return and give thanks. Jesus lets us know he noticed both the gratitude (your faith has saved you) and also the lack of gratitude (where are the other nine?). May we be counted among the thankful. God notices.